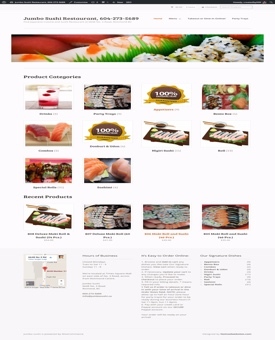 Here’s an example of a basic ecommerce website that was designed for JumboSushi.ca. Jumbo Sushi just wanted a basic ecommerce website, nothing fancy, with basic information about its restaurant, so we designed Jumbo Sushi’s site to make it easy for people to browse its menu, find contact, hours and location information However, unlike most restaurants that just list their menu on their website, ecommerce was added to it so that customers could also easily order online. Jumbo Sushi anticipates this will increase business as people can now conveniently order online on their desktops, smartphones or tablets from where ever they are to dine in or take out at this popular restaurant.